For those of us lucky enough to have seen, heard and/or met Jaki Byard (1922-1999), the pianist/composer/educator left an indelible impression. As a pianist, his ebullient style cam be traced back to the "Rent Party" players of the Harlem Renaissance (James P. Johnson, Eubie Blake) in that the keyboard was his orchestra. As a young man, Byard loved big band music, learned how to play alto and tenor saxophones, moved to Boston, MA, from his native Worcester, played and taught but it was not until he moved to New York City that he began to get critical notice. He worked with the mercurial bassist Charles Mingus, Eric Dolphy and, later, with Rashaan Roland Kirk. As rock music pushed jazz out of the public eyes and ears, Byard returned to Boston and to teaching (first at the New England Conservatory and later to the Hartt School and the Manhattan School of Music). Though mostly known for his small group recordings, Byard formed the Apollo Stompers in the mid-1970s, a raucous big band that included his daughters as vocalists. Jaki Byard died from gunshot wounds in 1999 and his killer has never been brought to justice. 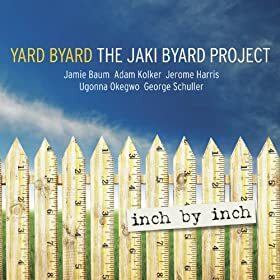 "Yard Byard: The Jaki Byard Project" (GM Recordings) is the work of 5 musicians - Jamie Baum (flutes), Jerome Harris (guitar), George Schuller (drums), Ugonna Okegwo (bass) and Adam Kolker (tenor saxophone, clarinet, bass clarinet) - 3 of whom (Ms. Baum, Harris and Schuller) worked and/or studied with the bandleader/Professor. You can't help but notice the absence of piano. Ms. Baum, for whom the Project has been a goal for a number of years, states on her website "the ensemble's desire is not to recreate "The Jaki Byard sound", but to both explore the beauty and creativity of his compositions and approach to the piano, as well as to convey his serious and whimsical sides." The results, titled "Inch By Inch", live up to the group's "desire." Tracks such as "Aluminum Baby" and "St. Mark's Among The Sewers" have that whimsical feel in both the melody and rhythms, the former driven by the lovely flute melody and Schuller's active percussion, the latter on Kolker's fine tenor sax lines pushed by Okegwo's active bass work. Jerome Harris, who is, perhaps, better known for his bass playing, is on electric guitar throughout the program. His handsome work stands out on tracks such as "Ode to Charlie Parker", where he insinuates his melodic lines around the tenor sax and flute, and on "Garr", where he leads the group in with his rippling phrases. Kolker and Ms. Baum are a formidable front line; the blend of their various instruments creates numerous sonic surprises. Clarinet and alto flute mesh with guitar for the joyful melody line of "Strolling Along" while the bass clarinet provides the foundation and counterpoint on "Toni." One can not help but notice the firm touch of Okegwo's bass work in support of the group and his solos stand out as well. Schuller keeps the music moving with his usual gleeful style; whether accentuating Kolker's tenor solo on "Dolphy" or relentlessly pushing the tempo on "Twelve" or dancing gently beneath the intertwined bass clarinet, flute and guitar lines on "Gaeta", Schuller stays the course. Yard Byard serves as a happy reminder of life and work of Jaki Byard. This quintet not only masterfully paints a picture that leaves no doubt of its love and respect for the person but also makes sure the listener knows just how special the man was. For more information, go to www.jamiebaum.com. Like Jaki Byard above, Steve Lacy was a musician for all seasons. Born in New York City in 1934, he first gained critical notice as a teenager playing Dixieland jazz and then went on to play alongside pianist Cecil Taylor in 1956 and 57. Lacy was one of the first musicians to record an Lp of Thelonious Monk's music and worked with the composer/musician on several occasions. He went on to form a quartet with trombonist Roswell Rudd (another musician schooled in Dixieland) in the early 1960s, formed a trans-Atlantic quartet with trumpeter Enrico Rava and then later worked with composer Michael Mantler. In 1969, he moved to Paris where he spent the next 2 decades playing with many of the finest European musicians, marrying cellist Irene Aebi and went to form several ensembles around her and alto saxophonist Steve Potts. He and Ms. Aebi moved back to the United States in 2002 to teach at The New England Conservatory of Music and died due to cancer in 2004. In 2006, baritone saxophonist Josh Sinton formed the quartet Ideal Bread to play the music of Steve Lacy, with whom he had studied at NEC. With the help of Kirk Knuffke (cornet), Tomas Fujiwara (drums) and Reuben Radding (bass), Sinton recorded a pair of CDs with the charts he had brought from his lessons with Lacy. For the group's 3rd CD, "Beating The Teens" (Cuneiform Records), Sinton decided to "recompose, reconstruct and reimagine" the music from Lacy's 3-CD set "Scratching The Seventies", a compilation of the 5 Lps the soprano saxophonist recorded for the French Saravah label. Bassist Adam Hopkins has replaced Radding in the lineup and fits right in to the experimental style Sinton has created for this music. One of the joys of listening to what the quartet does with this music is that the songs do not easily fit into any one genre. "Blinks" bounces along atop a martial beat while "Three Pieces from Tao" is now divided into 4 sections that bookend the program. "The Oil" has a punk-rock feel while "The Uh Uh Uh" dances along on a New Orleans groove. Instead of describing each track, I'd advise to pay attention to the interactions of the quartet, to the clear tones of Knuffke's cornet, and to the great range of Sinton's baritone sax (yes, Lacy played soprano in his groups yet Sinton can sound like a tenor and alto plus can reach fairly high without screeching). The rhythm section shines brightly as well. Hopkins is a melodic bassist with a full tone and Fujiwara is so inventive, such a fine cymbal player with accents that make one smile (it's fascinating to read that Sinton wrote out the drum parts.) "Beating The Teens" is modern music, a reminder that the "tradition" of creative music is ever evolving and that the legacy of Steve Lacy lives on. Ideal Bread deserves to be seen and heard live - until then, climb into the wondrous world of this 2-CD set. For more information, go to joshsinton.com.